Efforts have been made to broadcast adjunct data alongside the audio visual materials for at least two decades, from the first deployments of Teletext and TV receiver colour correction signals, through to closed captions, anti-ghost signals and most recently to HTML-compliant data streams. Today’s broadcast ‘viewers’ have ever increasing degrees of computer processing power available to enhancing the television experience. Embedded processor systems deliver data on screen from auxiliary information streams, navigators, guides and links to other media locations. WebTV like many other high tech organisations has its roots in a garage in Palo Alto California. In 1995 WebTV networks was founded in a former car dealership. WebTV developed a unique service to provide easy Internet access and enhance the TV-viewing experience that relied solely on a television and a telephone line. WebTV brought a high quality Internet browsing experience to many homes that did not have ready access to a PC. In 1997 Microsoft Corp. acquired WebTV, and today WebTV Networks still operates as a wholly owned subsidiary of Microsoft. WebTV Networks today serves over 1 million subscribers in North America. The services include WebTV Classic, WebTV Plus, and WebTV Personal TV services. In the future WebTV products are moving away from simple viewing of internet content, a market which is amply served by ever decreasing cost PC products, to a new vision of what TV can become by integrating personal video recording, multiple tuners, rich agent based navigation over a multitude of channels, and streaming media which can turn every internet site into a TV station. A first example of this new generation is the UltimateTV product that will be available to US consumers for Christmas 2000. From the experience and technology gained from the WebTV subsidiary, Microsoft also launched the Microsoft TV platform, a family of client and server software that allows other operators to build their own branded services similar to WebTV. The products in the Microsoft TV platform—Microsoft® TV Advanced, Microsoft® TV Basic Digital, Microsoft® TV Server, and Microsoft® TV Access Channel Server—make it possible for network operators to offer consumers an array of new and engaging enhanced TV programs and services on both today's digital set-top boxes and next generation TV-based devices. In addition Microsoft TV Technologies will be offered in the next generation Windows products (code name ‘Whistler’) to enable enhanced TV functionality in devices of the PC architecture. Build a variety of set-top box products ranging from a simple Internet terminal that displays Internet content on TV to an interactive Enhanced TV Receiver that combines sophisticated Internet and TV content and functionality as well as digital video recording and home networking support. 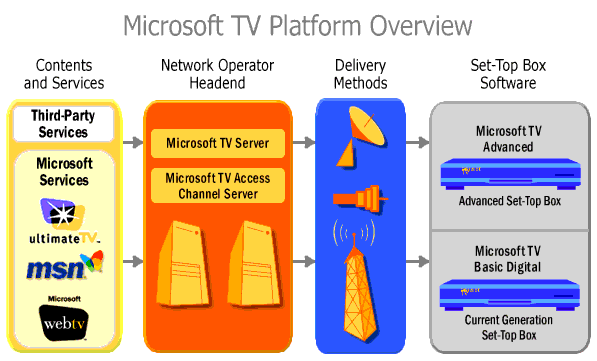 Microsoft TV Advanced enables network operators to deploy interactive TV services to subscribers via set-top boxes or other TV devices connected to telco (analog dial-up), PSTN (xDSL and ISDN), digital terrestrial, satellite, and cable networks. Microsoft TV Advanced can be deployed on any hardware platform that meets the minimum hardware requirements, and it can connect to any Internet Service Provider (ISP) without loss of flexibility. It is also fully internationalised with broad support for localisation. Microsoft TV Advanced uses standard Microsoft APIs such as Win32 and DirectX, and supports COM, ActiveX, and GDI, giving partners a rich programming environment for adding and modifying functionality to set top box products. Similarly, partners can create a custom user interface and control applications using standard HTML, JScript, and ActiveX according to established guidelines. At the core of all interactive programming in Microsoft TV Advanced is a WWW browser built on top of the Windows CE. The Microsoft TV Advanced browser is a fully specified WWW browser optimized to provide high-quality presentation for TV display. The Microsoft TV Advanced browser provides nearly full support for HTML 4.0. In addition, the Microsoft TV Advanced browser provides extensions, most of which address TV presentation. These additional features include support for translucency (as a style applied to any element) as well as extensions to support the unique requirements of discrete navigation and selection. The Microsoft TV Advanced browser provides full support for CSS1 style sheets as well as support for Absolute Positioning from CSS2. The Microsoft TV Advanced browser provides support for a subset of the WWW Consortium’s Document Object Model (DOM) Level 1 Specification. Perhaps one of the most significant ways in which the browser’s object model differs from the Internet Explorer object model is in the window object. The browser’s window object represents a layer in the browser’s layer stack. Consequently, many of the properties and methods of Internet Explorer’s window object are not relevant to the Browser, and some of the browser’s unique methods and properties are not supported by Internet Explorer’s window object. Note The Microsoft TV Advanced browser does not support dynamic content features such as inner/outer Text/HTML, DOM collections and the DOM event model at this time. The Microsoft TV Advanced browser provides support for an ECMA-262-compliant Internet scripting language called Microsoft TV Advanced JScript. It supports an extensive subset of the objects provided by Microsoft JScript, the language implemented in Microsoft Internet Explorer. The Microsoft TV Advanced browser provides full support for the Advanced Television Enhancement Forum (ATVEF) specification. ATVEF offers a standards-based architecture based on proven protocols for developing embedded and background TV, IP multicast data delivery, VBI triggers, and all required content formats. ATVEF leverages tools, media, and knowledge developed for the WWW and applies them to services necessary to design and deliver compelling interactive television content. The Microsoft TV Advanced browser supports a wide range of media types including image, audio, and video. The table below lists the supported media type formats. GIF89a, JPEG, Progressive JPEG, BMP, Xbitmap, PNG, Macromedia Flash. Microsoft TV Advanced provides a plug-in media handler architecture that lets partners add ActiveX controls to handle media types that the browser does not already support. The browser supports Windows Media Player (WMP) technology. The browser provides a WMP Control, a programmatic interface available to JScript that can playback streaming and non-streaming files. Windows Media Files can be embedded in a web document or referenced through a link. all of who have, or are currently studying, specifications to bring Internet like content to television as the industry moves to digital delivery. ATVEF delivered their recommendation in July 1998. ATVEF is an HTML 4.0 based emission format. Recently SMPTE has taken on the job of formally standardising the ATVEF specification, and the ballot procedure for accepting this is expected to finish by the end of November 2000. The ARIB, ATSC and DVB standards all specify an XML 1.0 based markup language as their principal markup content, and use the XHTML modularisation scheme to determine the specific elements that should be allowed. In the case of ARIB, the adopted language is known as BML (Broadcast Markup Language). In the case of ATSC, the adopted language is known as XDML (Extensible DTV Markup Language). DVB have yet to define a formal name, DVB-ML is used in this document. The goal was to create a platform that could be supported across all television environments (analog or digital; cable, satellite, or terrestrial broadcast), and which leverages the huge base of tools, media, and know-how that has developed for the Web. ATVEF has become a proven, multi-industry supported selection of W3C formats for bringing an interactive experience to television, and has wide support in the broadcaster’s world. Its standards-based architecture benefits the content industry with web compatibility both in deployment and generation tools, extensive documentation, existing content decoders and receiver solutions. The ATVEF proposal moves HTML to the Broadcast Arena using "Announcements," which are made up of "Enhancements" and "Triggers". Announcements are pointers to data to be used in a broadcast. Announcements can also have multiple streams for varying set-top box profiles. For example, some boxes may support 3D and 16-bit color graphics, while others may only support simple text and 8-bit color graphics. Announcement description fields allow easy picking of appropriate streams. Triggers are ECMAScript snippets that can dynamically update pages. For example, a stock ticker web page overlaying a news feed could have a triggers containing price quotes which are formatted into a personalised ticker. The Session Announcement Protocol and Session Description Protocol (SAP/SDP) for announcing streams of interactive content. The Hypertext Markup Language (HTML) and related data formats (CSS1) as the mechanism for describing the presentation of graphics, text, video, and other multimedia. Uniform Resource Identifiers (URIs) as the mechanism for referencing all multimedia elements, including television broadcasts and other content delivered over uni-directional links. ECMAScript and a Document Object Model for dynamic control of HTML content and the synchronization of HTML content to broadcast video. Multipurpose Internet Mail Extensions / Hypertext Transport Protocol (MIME/HTTP)-style headers as the representation for content meta-data. A protocol for transporting content and related meta-data over uni-directional links using multicast IP (in other words, an IP multicast-based uni-directional HTTP). A specific URI scheme for describing television broadcasts. A specific URI scheme for describing content delivered over a uni-directional link (and therefore not available on demand). A mechanism for sending fragments of ECMAScript over a uni-directional link to specific pages on a client in order to trigger actions that synchronize those pages to the television broadcast. The ATSC (Advanced Television Systems Committee) is an international organization that is establishing voluntary technical standards for advanced television systems. ATSC Digital TV Standards include digital high definition television (HDTV), standard definition television (SDTV), data broadcasting, multichannel surround-sound audio, and Satellite direct-to-home broadcasting. In 1996, the United States Federal Communications Commission (FCC) adopted the major elements of the ATSC Digital Television Standard (A/53) for the nation's next generation of broadcast television. In addition, Canada, S. Korea, Taiwan and Argentina have also adopted the ATSC DTV Standard for digital terrestrial broadcasts. Recently the ATSC has issued a draft specification that defines an architecture and a collection of facilities by means of which declarative applications may be delivered in an ATSC data broadcast service to a user agent embodied by a compliant receiver. This approach is similar to the ATVEF approach, but is updated to reflect some of the newer W3C work. In particular XHTML modularisation, CSS2, and DOM2. DVB (Digital Video Broadcasting) is a consortium of around 300 companies in the fields of Broadcasting, Manufacturing, Network Operation and Regulatory matters that seek to establish common international standards to facilitate the move from analog to digital broadcasting. For the last three years the DVB has been working on a standard for a digital receiver (known as the Multimedia Home Platform or MHP). This receiver specification will, in its next incarnation (due late 2000), include an application format based around Internet standards. This again takes many of the elements established by ATVEF and updates them to the modern facilities offered by newer W3C standards. The DVB application format will be broadly similar to the ATSC format, but includes some specifics tailored to the MHP receiver architecture. ARIB (Association of Radio Industries and Businesses) is a non-governmental group of radio communication equipment manufacturers, broadcasting equipment manufacturers, electric communication companies, service providers and other users established to develop standards related to radio communication equipment, broadcasting transmission equipment, and reception equipment. ARIB in 1999 established their standard entitled "Data Coding and Transmission Specification for Digital Broadcasting" in Japan, this again is an XML-based specification. The ARIB B24 specification derives BML from an early working draft of the XHTML 1.0 Strict document type, which it extends and alters. It appears that the ARIB B24 specification makes partial use of early XHTML 1.0 and XHTML Modularization (XHTMLMOD) working drafts, which have subsequently changed. For example, the BML DTD references two parameter entities, XHTML1-struct.module and XHTML1-frames.module, neither of which are defined by either XHTML 1.0 or the current XHTML Modularization Proposed Recommendation. The ARIB B24 specification references the May 5th 1999 working draft of XHTML 1.0 and the April 6th 1999 working draft of Modularization of XHTML. As a consequence of significant changes to both XHTML 1.0 and XHTML Modularization specifications, and a number of errors the ARIB B24 specification is substantially out of date with respect to the current W3C specifications in this area. As presently defined and not XHTML Host Language conformant.